Want to be notified of new releases in vaemendis/qwaccent? QWaccent is a QWERTY keyboard layout with additional shortcuts to easily write in French. It is derived from the UK Extended layout. The only modifications affect the input of diacritics. So any UK keyboard can be used as-is, without stickers or specifically printed keys. QWaccent is currently available for Windows only. Contributions to provide MacOS and Linux versions are welcome ! Download and unzip the QWaccent package. 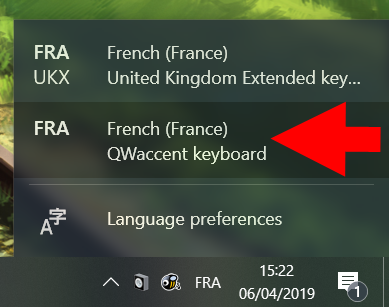 QWaccent layout has been designed for developers (or more generally people who favor QWERTY keyboards) who also need to write in French. QWaccent layout aims to minimize the use of dead keys when writing French diacritics (é,à,û,ï...). It also tries to be as easy to use as possible, by sometimes choosing efficiency over consistency: the most often used diacritics are placed on their corresponding letter key. Other diacritics are placed on adjacent letters. Consistency is preserved for dead keys though. If you forget a shortcut, you can still write your diacritic using them, as there are easy to remember (they are the same as the default UK Extended layout). The backtick key (`) is not a dead key anymore (use AltGr + backtick to use it as a dead key). As a consequence, the broken bar (¦) is not accessible anymore. Diacritics on letters W and Y (ẃ,ŷ...) cannot be written anymore (as these letter are used for other purposes and do not exist in French anyway). Layout picture designed with keyboard-layout-editor. Layout generated using Microsoft Keyboard Layout Creator 1.4 . Thanks to the qwerty-fr layout for the inspiration.